Today we are getting a fantastic sewing lesson from An of StraightGrain blog. An is an incredible seamstress based all the way over in Belgium! You’ll have to try out these three techniques for manipulating our buttery organic voile. The pleats create an interesting yet soft detail that will really make you look like a professional seamstress! You’ll have to try these out! Take it away An! Pleats can give a garment that little bit of extra, without being overly in-your-face. The downside is, of course, that pleating tends to involve a lot of measuring and marking. Or does it? This tutorial explains three ideas for what I would like to call improvisational pleating: Adding pleats to a fabric without measuring first. I used a basic bodice dress pattern in all three examples, but you could just as well add them to a bag, a pillow cover, and many more things. 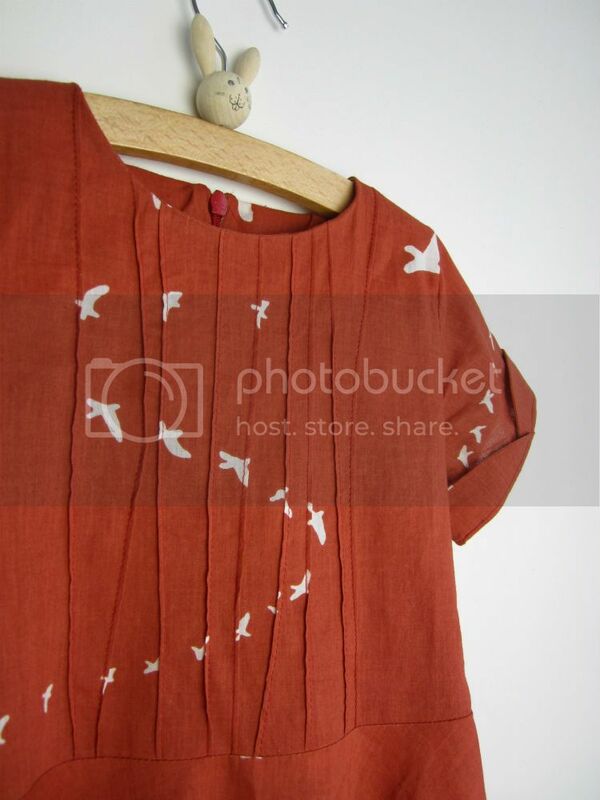 All three dresses are made from Birch’s beautiful new collection, Flight Voile. Voile is the perfect material for pleating: because it is so thin, pleats do not make it too bulky. In this first technique, a strip of fabric is cut from the bodice, and replaced with a pleated strip. I used the Hanami pattern, but you can apply this technique to any other pattern too, of course. 1. Decide on the width of the finished placket. Divide by two and subtract 1/2″ (or 1 cm) seam allowance. Transfer this distance to your front bodice pattern as shown in the picture below. Do not cut it off, but just fold it over – this way, you can use your original pattern again later on. 3. Remember the width of the finished placket you decided on in step 1? Add 1″ (or 2 cm) to this number. Cut a strip of fabric of this width; the length should be at least twice the length of the bodice. If you have plenty of fabric, cut your strip even longer; that way, you can later select that section of the strip which has the prettiest pleating. – Make sure not to put the pleats upside down. If they face upwards, they will start gathering dust and dirt. – Instead of making irregular pleats, you can also make regular ones, or gather the strip instead of pleating it. – Why not add some piping to the mix? You could include it between the pleated strip and the side pieces of the front bodice. The second technique works with pintucks (small pleats). It involves less work than the first technique, and it will take just a few extra minutes to complete your garment. The pattern used here is the Tinny dress pattern, with circle skirt. 1. Start with a piece of fabric which is a bit wider than your bodice pattern. One pintuck eats up less than 1/2″ (1 cm ) of fabric, so the picture below obviously shows much more extra fabric than is actually needed. As far as length is concerned, the piece of fabric does not need to be longer than the bodice pattern, but if you have more fabric than you need, take a longer piece. That way, you can later select that section of piece which has the prettiest composition of pintucks. 2. Starting in the middle of this piece, stitch vertical pintucks into this fabric by folding the fabric with wrong sides together, and stitching at about 1/8″ (3 mm) from the fold. You can create curves in the pintucks by slightly changing the direction of the folds as you are stitching. – Practicing the pintucks on a leftover piece first helps you create exactly those shapes you would like. – This idea can work vertically as well – you will need a piece of fabric which is longer instead of wider than you bodice pattern. – Try using contrasting instead of matching thread to stitch the pintucks. Why would pleats always need to be on the outside of a garment? In this final technique, pintucks are stitched on the wrong side of the fabric, creating a fun pattern of fake seams on the right side. For this last technique, I used a bubble dress pattern with short bodice. 1. Start with a piece of fabric which is a bit longer than your bodice pattern. One pintuck eats up less than 1/2″ (1 cm ) of fabric, so the picture below shows much more extra fabric than is strictly needed. Also allow for a bit of extra width, as diagonal pintucks can also make the fabric a bit more narrow. That being said; these are the minimum requirements. If you have more fabric than you need, take a longer and/or piece. That way, you can later select that section of the piece which has the prettiest composition of fake seams. 2. Stitch a pattern of vertical pintucks into this fabric by folding the fabric with right sides together, and stitching at about 1/8″ (3 mm) from the fold. – Practicing on a fabric left-over first may be helpful. Play around with different tensions to get the prettiest result. – If you make the pintucks cross each other, the faux seams in the front will make a little ‘jump’, which gives a very nice visual effect (see pictures). The wider the pintucks, the bigger the ‘jumps’. – Are you using very sheer fabrics? Keep in mind that you might see the pintucks through the fabric – you might want to keep them rather narrow in that case. Great ideas An. I love plain bodices (and simple styles) for this very reason – they leave room for FUN! Cool, Victoria! I'm looking forward to seeing the result 🙂 And happy birthday to little miss M! You should really give it a try! Your daughter will be superhappy with it, and the gratification for you will be huge! Especially if you make a dress with a circle skirt – she'll love twirling around in it.